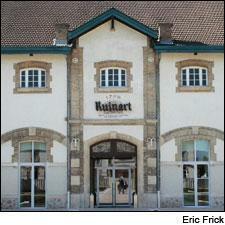 Champagne Ruinart was the first house to exclusively sell Champagne. While rosé Champagne has enjoyed strong sales in recent years, recently uncovered documents prove that pink bubbly is no temporary fad. Historians at Champagne Ruinart found papers recording that on March 14, 1764—250 years ago—Ruinart sold bottles of rosé Champagne. It was previously thought that Veuve Clicquot was the first to produce and sell rosé Champagne, in 1775. "It was really a big surprise," said Isabelle Pierre, a historian who analyzes house archives for Krug, Ruinart and Veuve Clicquot, all of which are owned by French conglomerate LVMH. "Our work is a lot of chance. You pick out one piece of information in a document, out of hundreds of documents, and think that you might have something." Founded in 1729, Ruinart was the first house to exclusively sell Champagne, or "wine with bubbles," as it was referred to in house ledgers in those early days. An entry listing "a basket of 120 bottles, 60 of which were Oeil de Perdrix," in the 1764 house account books was the initial finding leading archivists to believe that Ruinart bottled and sold rosé Champagne prior to Veuve Clicquot. Oeil de Perdrix, or "eye of the partridge," is a French term that refers to the pale copper color of a recently-shot bird's eye, and it is still used by a handful of producers today, in Champagne as well as for still rosés from elsewhere in France. Toward the end of the 18th century the wine was labeled instead as rozet, and then later as rosé, as it is today. These original bottles of oeil de perdrix undoubtedly shared the pale pink or salmon hues associated with many modern rosés, but it's unlikely that the wines tasted very similarly on release. "I would assume the wine tasted very differently than the wine tastes today," said Frédéric Panaïotis, chef de cave for Ruinart. "Back in those days, there were different grape varieties, different production methods. I would love to know, but how can you say?" Today's Champagnes are made from Chardonnay, Pinot Meunier and Pinot Noir, while Champagne in the 18th century allowed a much wider variety of grapes, including Pinot Noir and Pinot Meunier, but also varieties little-known today such as Fromenteau or Petit Meslier. And notably, no Chardonnay was used. More essential to rosé Champagne is the production method, and Panaïotis guessed that the oeil de perdrix was likely created by mistake, quipping, "Maybe some guy didn't wake up in the morning, or they were short-staffed, so there was extra skin contact." After analyzing additional archival material, the Ruinart team believes it likely that maceration was used to produce the oeil de perdrix, and it could very well have been an accident the first time it happened. With maceration, black-skinned grapes are crushed and the skins remain in contact with the juice for a longer period than is normal for white Champagne. The skins are then removed prior to fermentation. The result is a pale pink Champagne. The vast majority of present-day rosés are created using blending, a method firmly credited to Madame Barbe-Nicole Clicquot of Veuve Clicquot. Unhappy with the taste of rosé Champagne made via maceration, the famed widow experimented extensively with other techniques and variations on the production process, finally opting to blend red and white wine together (prior to the second fermentation in the bottle wherein the bubbles are created) in order to achieve her desired results for rosé Champagne. "The innovation of Madame Clicquot, who added red wines to the blend in 1818, was visionary," said Dominique Demarville, chef de caves for Veuve Clicquot. Of the recent revelation, he added, "[This is] good news for Ruinart, but also for Veuve Clicquot and for all Champagne producers. It shows that the demand for rosé Champagne existed more than 200 years ago—it's not a trend, but a constant market."